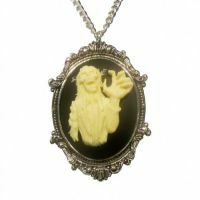 Gothic Zombie Cameo Ivory on Black in Frame Pewter Necklace [NK629Z] - $12.99 : Mystic Crypt, the most unique, hard to find items at ghoulishly great prices! Gothic Zombie Cameo Ivory on Black in Frame Pewter Necklace. Cast in high grade pewter. Silver antique finish. 20 inch neck chain. 2 1/4” high x 1 1/2” wide. All Jewelry is packaged with Black Custom Back Card. Made in the USA.